The Illinois Valley Archaeological Society (IVAS) featured speaker will be David Nolan, Coordinator for the Western Illinois Field Station of the Illinois State Archaeological Survey (ISAS) of the Prairie Research Institute at the UIUC, who will present a talk titled “Cue the Highlight Reel: An Overview of Three Decades of Interesting Archaeological Discoveries from Western Illinois”. This event is free and the public is invited to attend. Refreshments will be available following the presentation. This informal slide talk will focus on significant finds and stunning artifacts derived from IDOT-sponsored and research-generated archaeological investigations that he has been involved with in the area. David Nolan has worked as an Illinois cultural resource archaeologist since 1983 for Western Illinois University (WIU), the Center for American Archeology (CAA) in Kampsville, and the University of Illinois at Urbana-Champaign (UIUC). 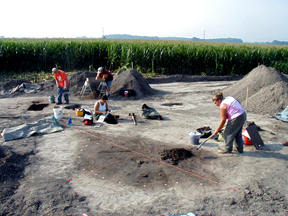 He is currently the Coordinator for the Western Illinois Field Station of the Illinois State Archaeological Survey (ISAS) of the Prairie Research Institute at the UIUC. In this capacity, Mr. Nolan directs archaeological investigations for IDOT-sponsored projects that take place in 30 western Illinois counties, ranging from the Quad Cities to Alton, including both the Illinois and Mississippi River valleys. Over his 35 year-long career, Nolan has authored or co-authored numerous technical reports, book chapters, and professional journal articles, as well as given many public talks, about the archaeology of the region.